A newly released nationwide health survey of Haiti shows continuing positive trends on key health-care indicators in particular those of Haitian women and children. The latest survey, undertaken by the Haitian Ministry of Public Health and Population, was conducted in 2012 and compares with the prior survey done in 2006. It shows steady improvements among key indicators despite significant health challenges in Haiti due to the 2010 earthquake and cholera outbreak. Of note were improved indicators for child vaccination and malnutrition, infant and child mortality, women’s health and contraception use. The report indicated no increase in HIV prevalence, which remained steady. The Morbidity, Mortality, and Service Utilization Survey measures progress and setbacks in health outcomes over the years. 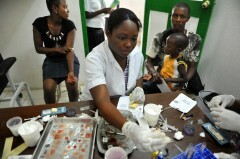 The results were announced July 9 by Dr. Florence Guillaume Duperval, Haiti’s Minister of Public Health and Population. The survey has been administered in Haiti five times since 1994. The previous survey was administered in Haiti between 2005 and 2006; this latest survey was conducted from January 2012 to June 2012. Over 13,000 households participated in the current survey, representing rural and urban areas in all of Haiti’s 10 departments, including camps for people displaced by the January 2010 earthquake. The results were eagerly anticipated by health experts concerned of possible setbacks brought on by the devastating quake, which killed more than 230,000 people and displaced more than 1.5 million. However, the survey results show that many health outcomes have improved in Haiti. The data collected in the survey show improvements in women’s health, improved nutritional status among the population, and an increase in use of contraceptive methods. Currently, more than two-thirds of pregnant Haitians have made the recommended number of antenatal visits, an increase from 50 percent in 2006; the prevalence of anemia among women has declined from 55 percent in 2000 to 49 percent in 2012; and the use of modern contraceptive methods among married women has increased from 22 percent to 31 percent between 2000 and 2012. Health data for children also showed positive results. Childhood vaccinations increased from 53 percent in 2006 to 62.5 percent in 2012. With regard to nutrition, the survey showed that 22 percent of children under 5 suffer from chronic malnutrition, a decrease from 29 percent in 2006. The survey also revealed a decrease in acute malnutrition from 10 percent in 2006 to 5 percent in 2012 and a decrease in percent of children underweight from 18 percent to 11 percent. Childhood mortality has decreased in Haiti over the last 15 years. Survey results show that infant mortality has decreased from 79 to 59 deaths for 1,000 live births. In addition, mortality for children under 5 has also decreased from 112 deaths to 88 deaths per 1,000 live births. Among other results, the survey revealed that the HIV prevalence among those ages 15-59 have remained the same: 2.7 percent among women and 1.7 percent among men. USAID is working closely with the Government of Haiti to continue to improve health outcomes for all Haitians. “The information in this survey forces us to continue to work together, to strengthen our interventions and our methods so that progress in the health sector in Haiti is sustained,” said Marc Desjardins, Deputy Chief of Mission of the U.S. Embassy in Port-au-Prince, during the July 9 event. USAID’s goal is to improve access to health care services and build the Government of Haiti’s capacity to manage and oversee its health programs. Currently, about 50 percent of the population has access to a vast network of USAID-sponsored health facilities throughout the country that provide core health services such as maternal and child health, family planning, and nutrition. In addition, diagnostic and treatment services for tuberculosis and HIV and AIDS services can be accessed at these health facilities. HIV and AIDS services include access to antiretroviral therapy, prevention of mother-to-child transmission, palliative care, and voluntary testing and counseling. USAID programs aim to reduce risky behaviors and maintaining people living with HIV and AIDS on treatment. Much remains to be done in Haiti. For example, despite high levels of knowledge of family planning, only 35 percent of married women are using any method and 31 percent are using a modern method. However, the positive health trends revealed by this data shows that Haiti continues to move forward despite the earthquake, the ongoing cholera epidemic, and many other challenges that threaten health outcomes. These results are a testament to the hard work and strong commitment of all of those who work to build a better Haiti. This survey was funded by USAID, the United Nations Children’s Fund (UNICEF), the United Nations Population Fund (UNFPA) and the Global Fund the Global Fund to fight AIDS, Tuberculosis, and Malaria through the United Nations Development Fund (UNDP), and the Canadian International Development Agency (CIDA). The fifth Morbidity, Mortality, and Service Utilization Survey combined with the Multiple Cluster Indicator Survey (MICS) was conducted by the Haitian Childhood Institute [l’Institut Haïtien de l’Enfance (IHE)] in collaboration with the Haitian Statistical and Information Technology Institute [l’Institut Haïtien de Statistiques et d’Informatique (IHSI)]. This survey was supported by the Ministry of Public Health and Population [Ministère de la Santé Publique et de la Population (MSPP)], benefited from the technical assistance of the Demographic and Health Surveys program (MEASURE DHS), which is implemented by ICF International. Read the full DHS report. See photos of USAID’s health-related programs in Haiti.